Human Treat Pack B - SORRY, ALL SOLD!! A lovely gift for your loved ones, especially those you have trained to go out and buy your doggie food and treats for you! This is because one of the items is a very LARGE shopping bag from Dog's Trust, roomy enough for your everyday essentials of biscuits, cheese, kibble and bones! 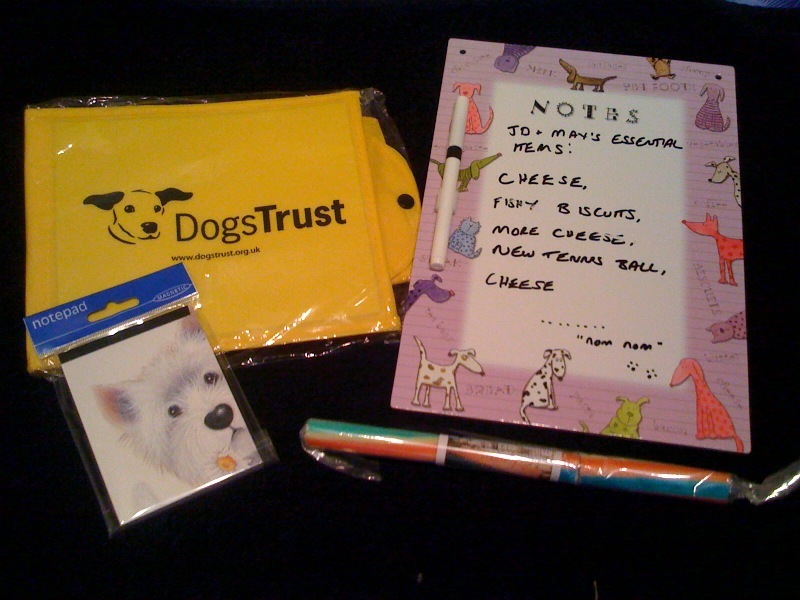 This human treat pack also contains a small magnetic doggie notepad, a cute doggie message board (to make sure your humans never forget to BUY your favourite foodables!) and a stick of Clacton seaside rock, a confectionery exclusive to our home town! A thoughtful yet practical gift for any human in your life! APOLOGIES - ALL ITEMS NOW SOLD! !